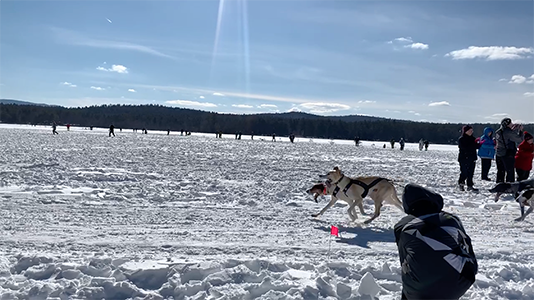 Sled dog racing has a long tradition in Tamworth. Arthur T. Walden, while living in Wonalancet, developed the iconic Chinook bred, founded the New England Sled Dog Club (NESDC) in 1924, and ran the first sled dog race in the area. In 1928, Walden became the lead dog trainer and driver for Rear Admiral Richard E. Byrd’s expedition to Antarctica. It must have seemed natural for the newly formed Tamworth Outing Club’s executive committee to sponsor and run the TOC’s first sled dog race in March of 1937. With conditions permitting, the TOC and the NESDC still run this race on the scenic expanse of Chocorua Lake and its surrounding trails. One of the longest-running sprint races in the world, the races are held from 9am to 3pm each day during an early winter weekend. Many dog teams from New York, Canada, and New England compete in this event. The number of dogs per team varies according to class, which progress from the one-dog juniors to the 14-dog professionals. The biggest teams will compete in the Pinetree Power Classic, starting both days at noon, running an 11-mile course on logging roads and snowmobile trails. Other events include one-, two-, three-, four-, and six-dog races, both amateur and professional, throughout each day. Admission is free for spectators, who are welcome to watch the teams, talk to drivers, and see the action. The proceeds from our concession trailer with food, hot beverages, and race memorabilia benefit the Tamworth Outing Club. With Mt. Chocorua as a backdrop, this is the most scenic race in the East.